The new Audio-Technica AT2020 USB+ offers studio-quality articulation and intelligibility. It plugs right into your computer’s USB port, and functions seamlessly with your favorite recording software. Equipped with a USB digital output, the AT2020 USB is perfect for home studio recording, field recording, podcasting and voiceover use. 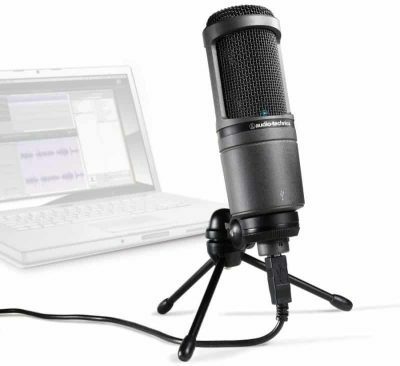 The Audio-Technica AT2020 USB+ is based on the design of Audio-Technica’s critically acclaimed AT2020 cardioid condenser microphone. Like the AT2020, it features a low-mass diaphragm, custom-engineered for extended frequency response and superior transient response. With low self-noise, the Audio-Technica AT2020 USB+ is perfectly suited for sophisticated digital recording equipment. Audio-Technica’s state-of-the-art design and manufacturing techniques ensure that the microphone complies with the company’s renowned consistency and reliability standards.